Important: This document goes along with the code at https://github.com/OlivierLD/raspberry-pi4j-samples/. 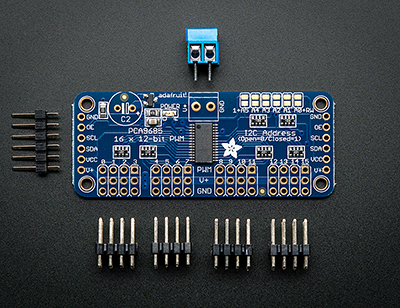 The Servo Driver we are talking about here is the Adafruit 16-Channel 12-bit PWM/Servo Driver - I2C interface - PCA9685. The original tutorial from Adafruit is available here. The language it uses is Python. This board has an I2C (pronounced I "square" C) interface, that needs to be enabled on the Raspberry PI. Arduino & Adafruit provide python libraries that go along with their components. The code we present here is in big part an adaptation of this code. We will need to edit several configuration files. Use the editor you prefer (nano, vi, gedit, ...), as root (sudo). Save your modifications, if you have done any. As seen above, the I2C addresses range from 0x03 to 0x77 (binary 0000011 to 1110111). This way, several boards can be used simultaneously from the RasPI, as long as their I2C addresses are different, even if the GPIO interface pins are connected to several different boards. The connection setting is quite simple. The Raspberry PI, connected to a PCA9685, with 2 servos. 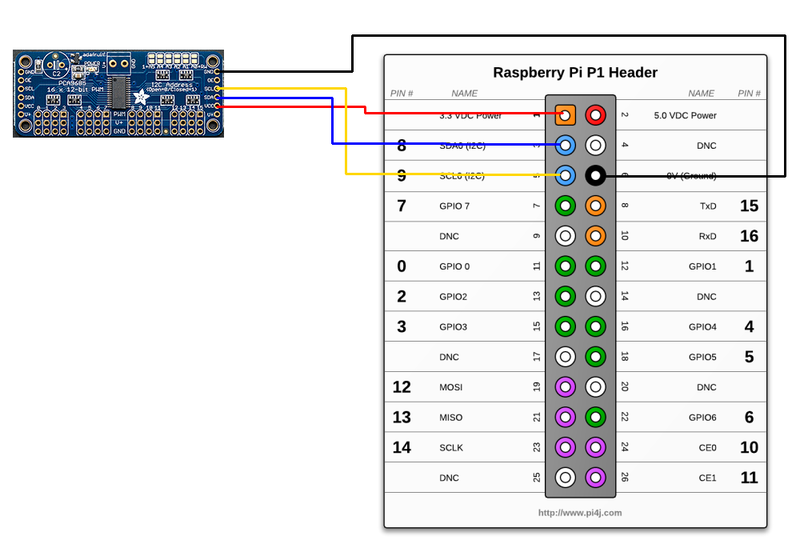 This diagram shows the name of the pins you want to use on the GPIO Connector of the Raspberry PI. As we said before, we need to use the pins 1, 3, 5, and 6. You will need to know what address to talk to to reach the PCA9685. Run the i2cdetect utility. We will use the 0x40 address to reach the PCA9685. The Java code we are interested in is in the class named PCA9685. Check it out in the repository. We are going to comment only on the main method of this class, which is a basic example. 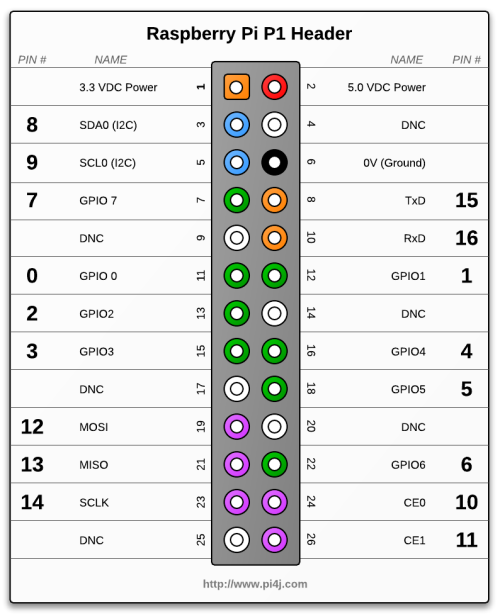 It assumes that 2 servos are connected to the PCA9685, on the 15 and 14 slots. The PCA9685 has 16 such slots, numbered - on the board - from 0 to 15. See them on the picture at the top of this document. The slots we are talking about are the 16 columns of 3 holes drilled at the bottom of the board. Their number is printed on top of each column of 3 holes. This code loops 10 times and makes the servos go from a value of 150 to a value of 600, and vice versa. It waits for 1000 milliseconds between each message to the servos. Notice the two int variables, CONTINUOUS_SERVO_CHANNEL and STANDARD_SERVO_CHANNEL. For this demo, the standard servo we use is the Standard servo - TowerPro SG-5010 - 5010. As seen in its documentation, the servo rotates on 180°, 90° on each side. Position "0" (1.5ms pulse) is middle, "90" (~2ms pulse) is all the way to the right, "-90" (~1ms pulse) is all the way to the left. We see we use a 60 Hz frequency. This means we will have 60 cycles per second. Each cycle contains 4096 ticks. The value minServo is 150. The value maxServo is 600. A full cycle (of 4096 ticks) at 60 Hz will take 1 / 60 ~ 16 ms.
150 ticks would take 150 / (60 * 4096) seconds, which is ~ 0.61 ms.
600 ticks would take 600 / (60 * 4096) seconds, which is ~ 2.44 ms.
TickTime = 1 / (freq * 4096). PulseTime = TickTime * nbTicks. It is quite easy - and convenient - to put those formulas in a spreadsheet. This is because all servos do not exactly follow the rules above. The servo I used range from 0.5 ms to 2.5 ms. See below the values I used successfully. 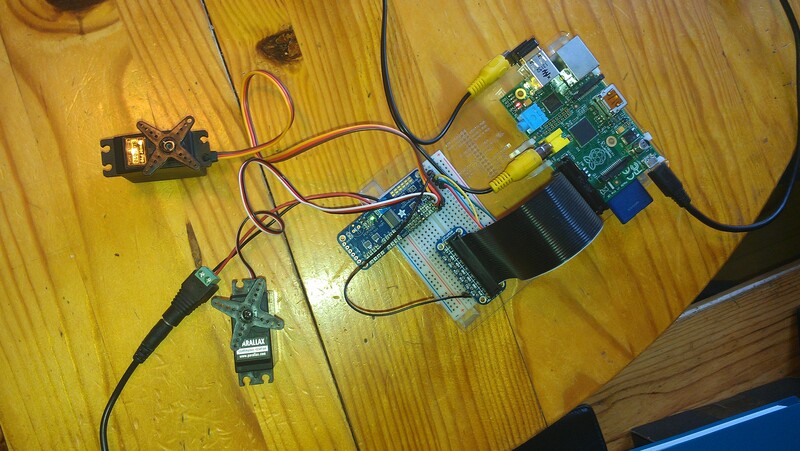 Fuel the Raspberry PI with a solar panel, oriented by servos to face the sun for greater efficiency. I followed the PWM instructions, came up with several spreadsheets for the calculations, and... it just did not work correctly. Both standard and continuous servos are supposed to be triggered with pulses having width ranging from 1 to 2 ms. As seen above, at 60 Hz, that makes 246 to 492 ticks. Those values are suprisingly different from the theorical ones..., but they work. See in the code the classes named i2c.samples.DemoContinuous and i2c.samples.DemoStandard. Those are the ones I will use as bases for robotic projects.